Cooperative in Davao Receives Solar Dryer – Jaime V. Ongpin Foundation, Inc.
Biao Agrarian Reform Beneficiaries Cooperative (BARBCO) is a leading ARB cooperative producing and processing quality Trinitario cacao beans and other agri-products in the Davao region, since 1992, with its own cacao nursery, warehousing, fermenting, drying and sorting facilities and organized logistics in place. They continually need to improve their products so they could be exported to other countries like Switzerland whose demand for cacao is high. In collaboration with SAGANA Association-Switzerland, EMBRACE provided materials for the construction of solar dryers to improve the quality of cacao beginning with the drying process. The construction took almost three months but the result was great! “We are very thankful to your contribution to our economic activities here in our barangay. The additional two mechanical solar dryers are very helpful to our cooperative, as well as to our members. Hopefully, we can also extend our services not just here but also to other places in Davao,” said Mr. Jun Andoy, BARBCO Manager. 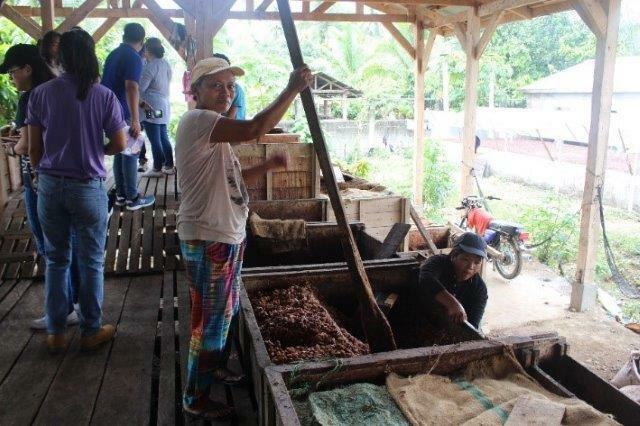 He added that with the new mechanical dryers, the production of dried cacao beans will increase by 35% or, from 8,000 to 10,800 kgs every month (for the two dryers). Other results will be reported after 3 to 6 months operation of the new solar dryers. Apart from the positive effects of the solar dryer on the production of cacao, these will also provide secure livelihood for the cooperative members and their families and other communities who deliver cacao to the coop, and will generate more employment during the peak harvest period of November to January including unpredictable weather conditions.